Images from the Center For Military History's Active Army Division history matrix. Original Photo Captions from CMH, "new text" by Brian Mead, with additional comments from a friend. Why is this important to us as living historians & reenactors? By showing these photos, I wanted to give you an idea of what small tidbits of information can be gleaned from a photograph. Often, some of the most interesting bits are quite small and almost unnoticeable. Each unit you portray is different, and by looking at the photos of that unit in the field, you are able to convey some of the training & personality of the men in that unit. Also remember that as these soldiers lived through the war, they gained experience, were issued different equipment, etc. The makeup of a soldiers kit could quite possibly change quite a bit from month to month. That's why it's so important to understand the specific era you're portraying & try to customize your impression for that unit/date/etc. You can also use knowledge you've gleaned from the photos to learn to carry your equipment more comfortably in the field. This will also allow you to show a bit of your own personality thru the way you wear your equipment. The Center for Military History has a webpage which details the history of each of the active Army Divisions. (1st Armored, 1st Cav, 1st ID, 2nd ID, 3rd ID, 4th ID, 10th Mtn, 25th ID, 82nd AB, and 101st AB) The photos below are from that site. Please visit the Center for Military History to view the full-resolution images, and all the other great images in the matrix. Below, I will first show the full photo, with highlights for each area of interest. 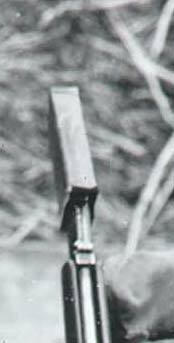 Then, I will show the close up of that portion of the photo, and will explain what I feel is an important "bit of information" for the living historian/reenactor. SC 189932-S A large group of American assault troops of the 3d Battalion, 16th Infantry Regiment, 1st U.S. Infantry Division, having gained the comparative safety offered by the chalk cliff at their backs, takes a "breather" before moving onto the continent at Colville-Sur-Mer, Omaha Beach, in Normandy, France. Medics who landed with the men treat them for minor injuries. 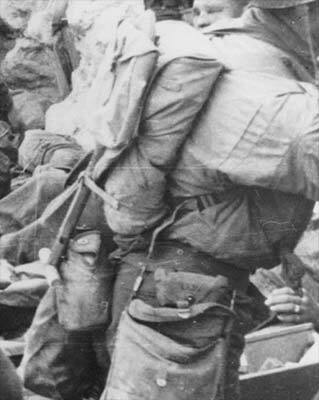 8 Jun 1944. Photographer: Taylor. 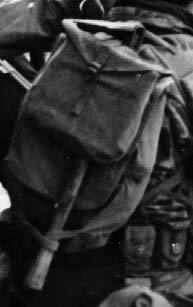 You'll notice that this aidman is wearing his M1910/1928 pack just as a backpack. You can see one of the front straps is attached to the base of the pack, and the other is hanging free. This allows the aidman to drop his pack quickly if need be. Also, notice that he has done away with the aidman's suspenders, and has attached his aid pouches directly to his pistol belt. 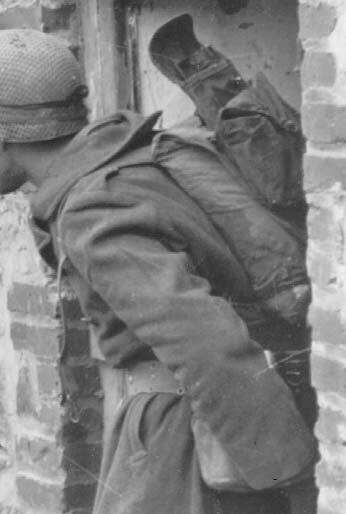 Notice this soldier has attached his M1928 Meat Can Pouch to the rear of his belt. The pouch also has a distinct "squared-off" appearance so we can assume that it does not contain the meat can (mess kit). Could it be some K-rats, or other boxed rations/ammo/etc? 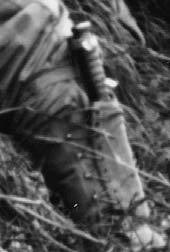 This soldier has opted to secure his knife with both a small strap around the leg, but also by slipping the scabbard inside his legging. This probably kept the knife from flopping around as he ran, kept him from catching the knife on stuff, and also kept the knife from sliding around on his leg. 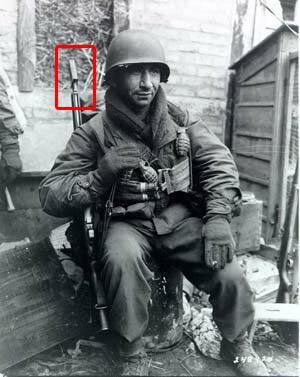 This soldier's M1928 meat can pouch also has the "squared off look". If you look closely, you'll see a mess kit knife handle sticking out from the top of the pack. I assume this is secured somehow to his e-tool cover. Also, you'll see that he's wrapped the pack strap around the e-tool handle to keep it from flapping around when he runs. 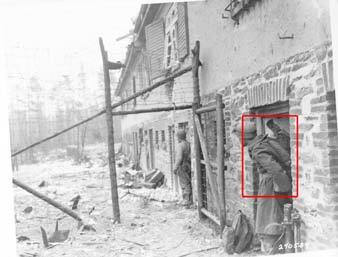 SC 270589 - American soldiers of Company G, 38th Infantry Regiment, 2d Infantry Division, U.S. First Army, take refuge in doorways during mortar barrage laid down by Germans after Yanks seized one of their forest strongholds camouflaged as a two-story residence. 165th Signal Company photograph by Pfc. 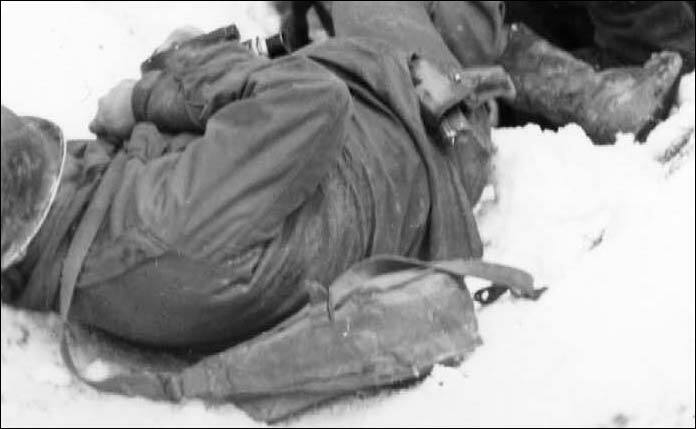 James F. Clancy, 16 December 1944. 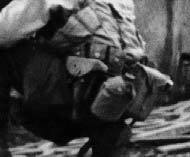 You can clearly see that this soldier's pack IS NOT attached to his pistol belt. The strap to attach the pack to the front of the belt is hanging free. With the pack separate from the belt, he can also drop the pack & access the contents of his pack/meat can pouch/e-tool without having to remove his ammo/water/carlisle bandage which are secured to his pistol belt. 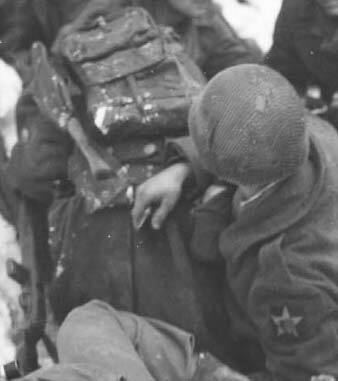 This soldier's M1943 folding e-tool is also secured high above his meat can pouch. You can see that the placement of the e-tool allows the soldier easy access to the "lift-a-dot" fastener...making it much easier to remove the e-tool quickly when needed. Also, note that in the photo, the e-tool carrier is not secured. 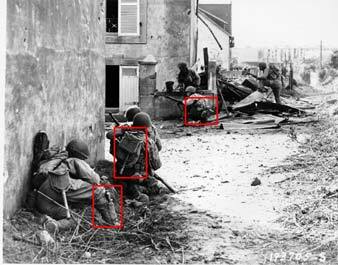 The soldier on the left has secured his e-tool to the left side of his M1928 pack. This is the location designed for the bayonet. 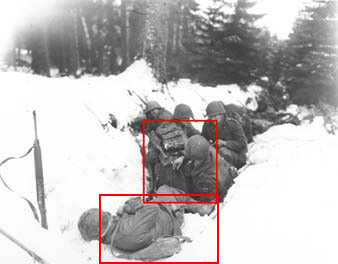 It might be worth pointing out the absence of gloves on those soldiers, even in the midst of the Battle of the Bulge. Of further interest to me is that I can't see any M1 RIFLEs in this pic! Plenty of carbines, so I wonder what role these guys played in the 9th Reg't? ... And the shoulder patch on the guy w/o the gloves is VERY narrow - not like the modern 2ID patches. 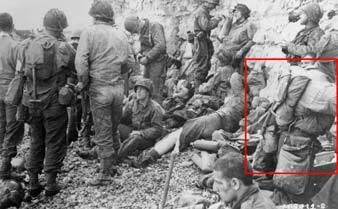 In this closeup, you can tell that the soldier laying on the ground is wearing a GP bag over his right shoulder. SC 248420 - Pvt. Michael Swinkin, an infantryman with the 1st Infantry Division, U.S. First Army, fully packed and equipped, waits to cross the Roer River, near Kreuzau, Germany. Company B, 1st Battalion, 16th Infantry Regiment, 1st Infantry Division. 2/25/45. Photographer: T/5 Jack Kitzerow. The neatest part about this photo is Pvt. Swinkin's impromptu muzzle cover. It's a waxed D-Ration box. He's used what's essentially a piece of trash to protect the bore of his weapon from dirt & water!